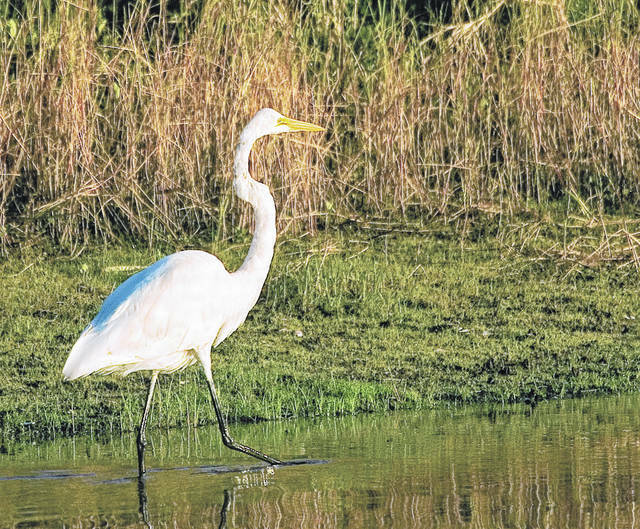 A Great Egret, shown in this stock photo, is one of the many birds recently seen in Wayne Lakes. The village now will serve as a bird-watching hotspot for a Cornell University bird study. WAYNE LAKES — The Village of Wayne Lakes, with a population of approximately 700, is also home to a great number of bird species. As such, the community, south of Greenville, now will be host to a bird watching “hotspot,” participating in a bird study by Cornell University. Wayne Lakes Mayor Ellen Brown said Wayne Lakes resident and birdwatcher Cindy Ploch approached her with the idea of teaming up with Cornell. “As Wayne Lakes moves forward on some of our other issues, what we’d like to do is open the area up for people to come in and have bird watching. I feel like that’s a good thing for Wayne Lakes and along with our fishing, we’re hoping to promote birding and fishing as reasons to come to Wayne Lakes,” she added. Ploch said among the most rare bird sightings she’s had of late include a Cattle Egret and a Great Egret. “We had a Great Egret in December, and it was a rare bird because it wasn’t supposed to be here in December,” she said. Ploch is not the only area resident to take a more-than-active interest in keeping track of the area’s feathered friends. At 6:30 p.m. Feb. 7, local photographer and bird watcher Chad Arment will give a special presentation at Shawnee Prairie on the many birds he has photographed in Darke County during the past year. Registration is required, but the program is free. Individuals can calll 937-548-0165 to register. For more information on the Darke County Birders Club, call Cindy Ploch at 937-547-0397. This entry was tagged Bird, Bird watching, Birding, Birds, Cindy Ploch, Cornell University, Darke County Birding Club, Database, Ellen Brown, Ornithology, Study, Tracking, Wayne Lakes. Bookmark the permalink.